What Dogs Were Bred to Make a Bichon Frise? The charming and playful bichon frise makes a loyal companion. 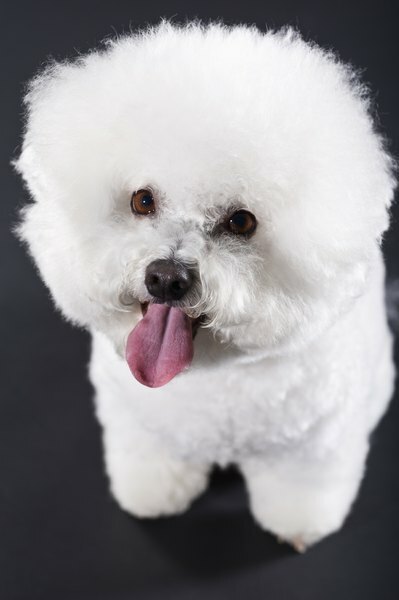 Full of fluff and fun, the bichon frise is revered for his playful yet gentle disposition. His intelligence and strong will are tempered by his adaptability and charm. Though once the companions of Europe's royalty and a favorite of artists and circus performers, these playful companion dogs hail from humble origins. Although it may be difficult to pinpoint the exact moment that the bichon frise came into existence, Phoenicians and other ancient cultures were known to have traveled with small white dogs, according to Bichon World. Spanish sailors kept the dogs as traveling companions when at sea and sometimes used them as a valuable trade commodity. Italian explorers found the dogs on the island of Tenerife and brought them back to Renaissance Italy, where they flourished as the pet of merchants and nobility. A direct ancestor of the bichon frise, the barbet is a curly haired spaniel well-suited to work in the water. Fearless and intelligent, the dogs were highly regarded as hunting companions to royalty and assistants to sailors. A playful dog with a woolly coat, the barbet is attracted to mud and swampy areas, according to the American Kennel Club. Barbets are renowned in France for their agility and have been instrumental in the creation of other breeds such as the Newfoundland. Although they nearly died out after World War II, the historic breed is making a comeback. As the dogs made their way from Italy to France after the French invasion in the late 1400s, they became well known in France as the barbichon, due to their barbet ancestry. The dogs' popularity swelled among the nobility through the 16th century. By the end of the 1800s, the dogs were no longer the royal favorites, but were content to accompany street performers and circus acts, according to Bichon World. After World War I, dog fanciers and breeders began to seek out the little dog known as the bichon or Tenerife, and the breed once again began to achieve popularity. When the breed standard was decided in France in 1933, the dogs were renamed "bichon frise," meaning "curly lap dog," in accordance with their appearance and characteristics, according to the Bichon Frise Club of America. The breed crossed the sea to America in 1956 with the Picault family, who eventually settled in California.